Merger mania is back with a vengeance this year. Companies have announced more than $2 trillion in deals so far in 2018. That's a record pace for merger activity, topping the deal volume from the first few months of 2007, according to Thomson Reuters. And if this keeps up, merger activity should easily pass the all-time annual record of $4.7 trillion in deals set in 2015. The acquisitions span the globe -- and various industries. • Health insurer Cigna (CI) is buying pharmacy benefits management company Express Scripts (ESRX) for $67 billion. • Japan's Takeda (TKPHF) is scooping up rival pharmaceutical company Shire (SHPG) for $62 billion. • German utility E.On (ENAKF) announced it would purchase green energy company Innogy for $27 billion. 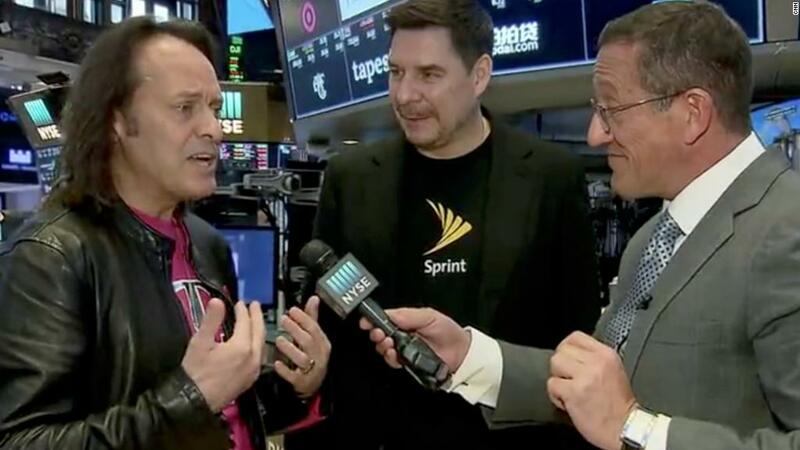 • Sprint (S) and T-Mobile (TMUS) even finally agreed to a $26 billion merger last month. • Marathon Petroleum (MPC) is buying fellow refiner Andeavor for $23 billion. • Vodafone (VOD) is acquiring cable assets of Liberty Global (LBTYA) in Germany, the Czech Republic, Hungary and Romania for about $22 billion. • And Keurig Green Mountain took over Dr Pepper Snapple for nearly $20 billion. What's fueling this flurry of mergers? Big companies have a ton of cash. And many markets around the world remain near record highs despite more volatility in 2018. This combination of healthy balance sheets and strong share prices gives firms the currency they need to pursue acquisitions. Some experts have argued that the M&A boom is one reason why smaller stocks are outperforming the broader market this year. Bigger companies recognize that many smaller firms are growing their sales and profits more rapidly, which makes them juicy takeover candidates. And investors seem to be taking bets on who the next M&A candidates might be. It might not be a bad strategy. According to a recent survey of 400 US CEOs by KPMG, 23% of business leaders said that they expected acquisitions to be one of their key strategies to help boost growth over the next three years. Whats more, 36% of the CEOs said they had a "high M&A appetite." "M&A is all about optimism and confidence. The level of confidence is still strong," said Dan Tiemann, the national service group leader for deal advisory & strategy at KPMG. "Despite the daily headlines, CEOs are still hopeful and they know they have to keep growing. You have to keep making bets and they have to pay off," Tiemann added. But some fear that protectionist policies in the United States could slow down merger activity, particularly with regards to Chinese and other Asian companies looking at American firms. The Committee on Foreign Investment in the United States has already blocked the purchase of San Diego-based chip giant Qualcomm (QCOM) by Singapore's Broadcom (BRCM), for example. "Technological dominance is likely to be at the center of a new era of intensifying competition between the U.S. and China," said Richard Turnill. global chief investment strategist with BlackRock, in a report this week. Turnill expressed concerns about what might happen if the United States continues to block acquisitions of American tech firms by Chinese companies. "Such actions may intensify and dampen M&A activity," he wrote.